The excruciating melodrama is over, at least for now: Sacramento will remain the home of the Kings, presumably under new ownership. What’s less clear is the future of the franchise in today’s NBA. The story of the rise and fall of the Kings includes a lot of stock sports characters: untrustworthy owners, lousy management, fed-up fans. Its central theme, however, is the basic tension within David Stern's National Basketball Association. For all of the commissioner’s efforts to push teams into smaller markets, his league reinforces the inherent advantages of big-city franchises. It’s easy to forget that 10 years ago, the Kings were a perennial playoff contender that regularly packed their dowdy arena. The second generation of the Maloof family, which assumed control of the franchise in 1999, seemed to be fulfilling some sort of prophetic destiny: The father, George Maloof Sr., had bought the Houston Rockets in 1979, then died suddenly in 1980, a year before the team reached the NBA Finals. The young Maloofs were laddish, enthusiastic proprietors, even civic-minded. In its 2003 survey of 121 professional sports franchise owners in North America, ESPN the Magazine ranked them third-best, citing—of all things—their loyalty to the local community. The Kings were like today’s Oklahoma City Thunder, a consistently overachieving small-market team. Since then, the Maloofs have squandered their father’s fortune—or rather, set it on fire with a series of bad casino and real estate investments in Las Vegas. Leveraged to the hilt, they stopped spending on the Kings and even borrowed more than $100 million from the NBA in recent years just to keep the franchise afloat. (Stern, who was friends with George, had a soft spot for “the boys,” as he called them.) The Kings haven’t made it to the playoffs since 2006. As for the Maloofs’ vaunted loyalty to the community, it was pitched onto the flames along with the family fortune. When they weren’t threatening to move unless Sacramento built them a new arena, they were negotiating with prospective buyers who wanted to move the team. Could the Kings have continued to thrive under smarter ownership? Sure. But the franchise would inevitably have bumped up against the economics of the NBA. For large-market teams such as, say, the New York Knicks or the Los Angeles Clippers, bad ownership isn’t fatal. For small-market ones, it can be, at least without an assist from the league. A comparison to Mark Cuban, owner of the Dallas Mavericks, is instructive. He bought the Mavericks in 2000 and remains the picture of a model owner. But he also moved the team right into a brand new arena—sponsored by American Airlines—amply outfitted with luxury suites and premium boxes. And the Mavs play in a corporate-rich city, not a state-government town. They make enough money to survive even the most colossal front-office blunders. Small-market teams can overachieve if they draft wisely and manage salaries well. But their success will almost always be fleeting. Right now the Thunder are winning games and turning a profit, but when the team invariably falters, it will no longer be a national phenomenon. It will be a struggling franchise playing in a taxpayer-financed arena in the country’s 45th-largest television market. 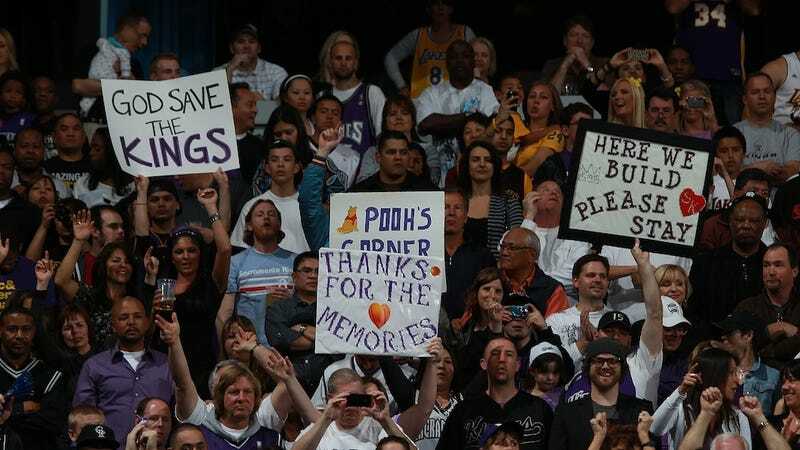 The Thunder will be lucky if their fans remain as loyal as Sacramento’s. In the end, the league’s biggest stars are always going to gravitate toward the league’s biggest markets. From a financial point of view, the NBA’s salary cap puts a premium on endorsement deals, which favor players in bigger markets. But it’s not just about the money—the salary cap makes sure of that, too. LeBron James didn’t go to the Heat for a payday. (His salary is actually below the league maximum.) All other things being equal, he went to Miami—South Beach, as he called it—because he wanted to live there and he wanted to win some championships with a few friends. It may sound counterintuitive, but super-teams are the product of restricted spending, not unrestricted spending. The NBA’s new collective bargaining agreement—a product of the 2011 lockout—may bring new windfalls to the league’s neediest teams, but it won’t necessarily close the widening gap when it comes to deals for TV rights. Nor will it stop the flow of talent to the big cities. If Stern truly aspired to competitive balance, he would talk about lifting the league’s salary cap, which leaves small-market teams with nothing to offer players that big-market teams can’t. What he really wants, though, is the appearance of competitive balance. After all, the NBA has already tried actual competitive balance, and it was a resounding failure: During the 1970s, the decade before Stern took over, eight teams won the championships, and no one noticed. Since then, a handful of teams have dominated the postseason, and the league’s revenues have soared. Where does this leave Sacramento? They’ve won the long fight to keep their team, but a tougher battle lies ahead for its new owners: Turning the little Kings into a successful franchise in America’s most rigged professional sports league. Jonathan Mahler is a sports columnist for Bloomberg View. A long-time contributor to The New York Times Magazine, he is the author of the best-selling Ladies and Gentlemen, the Bronx Is Burning, The Challenge, and Death Comes to Happy Valley. He's @jonathanmahleron Twitter.